This is a variation on the potted chicken with tomatoes that I did for the Aetna Healthy Food Fight. 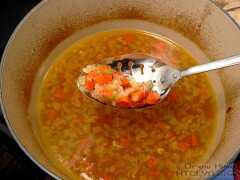 Actually, I should call the tomato recipe the variation, since other versions are much more like this one. 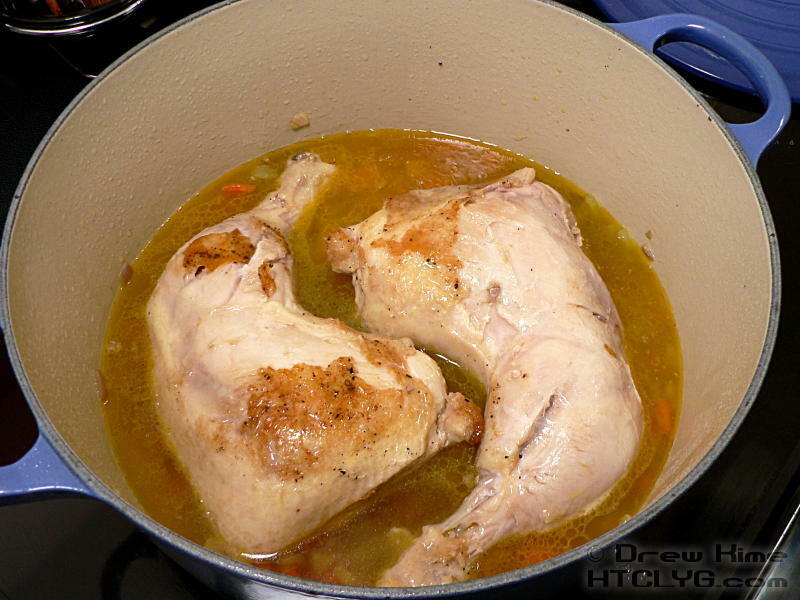 Whatever you call it, this produces some really delicious chicken, and can easily be turned into great chicken soup. 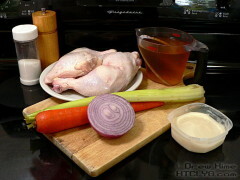 In any case, feel free to use pre-made chicken stock, or broth — and don’t get picky about what you call it, both Chow.com and Chef 2 Chef say the terms are mostly used interchangeably now. 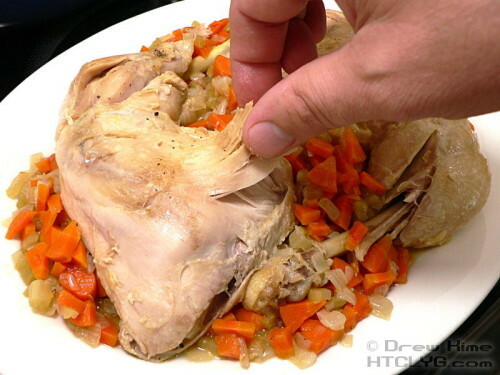 Another change in ingredients is I’m using pieces instead of a whole chicken. After the first potted chicken recipe, a couple of people asked if you could do it with pieces, and I said I’d do that and post an update. 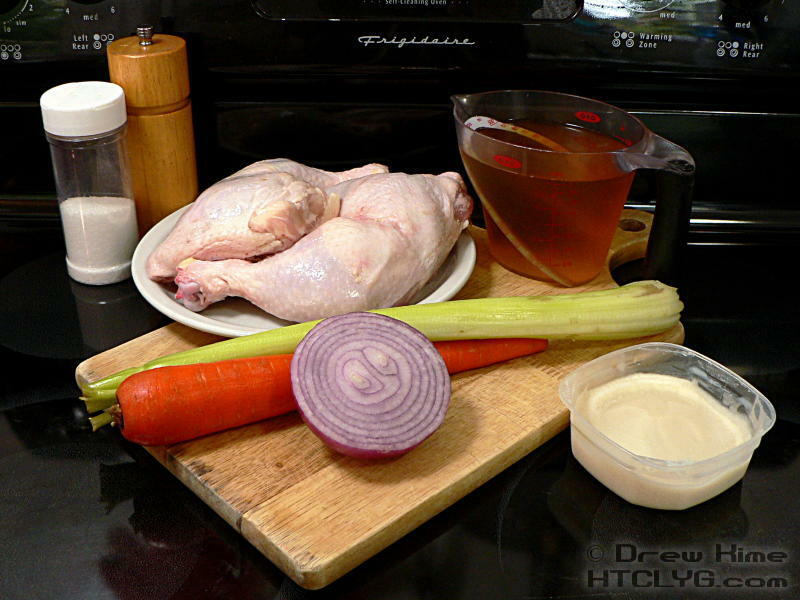 Before starting on the chicken, clean and dice the aromatics — the onion, celery and carrot — to make a mirepoix. 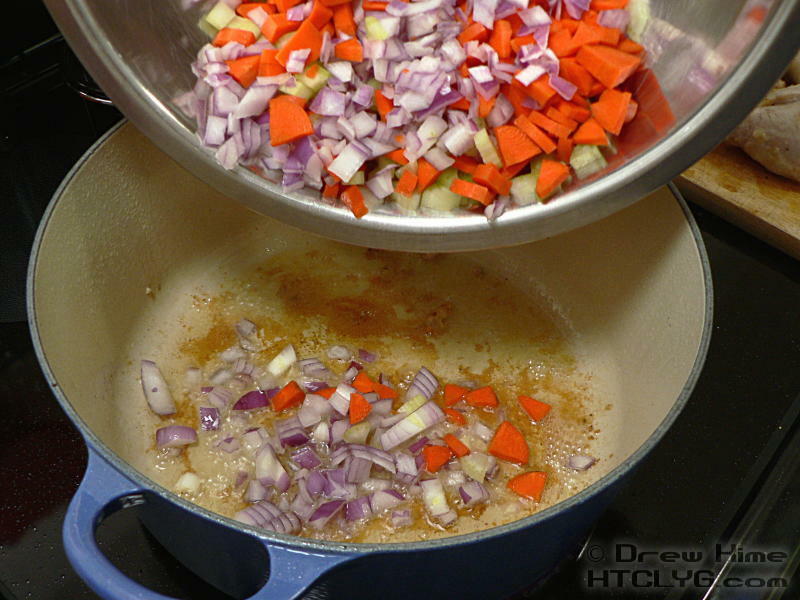 That link has the details, but here’s the short version: Equal parts onion, celery and carrot, diced and cooked, make the base of many recipes. And it’s called … that’s right, mirepoix. While you’re pre-heating the oven to 350°, coat the chicken with salt and pepper. You could dredge it in flour, but I left it out this time and didn’t miss it. 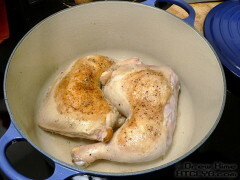 Melt the bacon fat or butter in a Dutch oven over hight heat on the stove-top, then add the chicken. I started skin-side-down this time. I made another batch a few days later and started cut-side-down instead. Go with that. 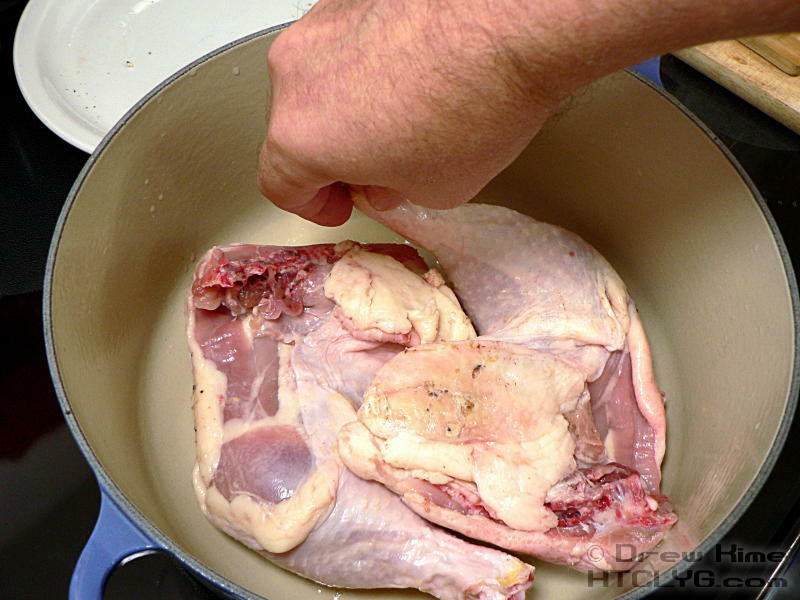 You’ll render out more of the chicken fat — also known as schmaltz, common in Jewish cooking — and keep the skin from sticking to the pot. I seasoned the cut side of the chicken after it was in the pot. 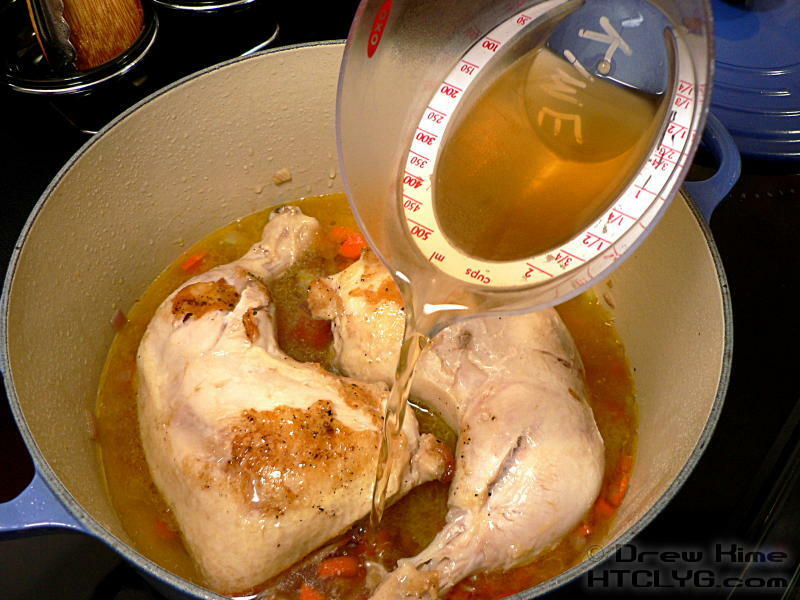 You can season both sides before putting it in. 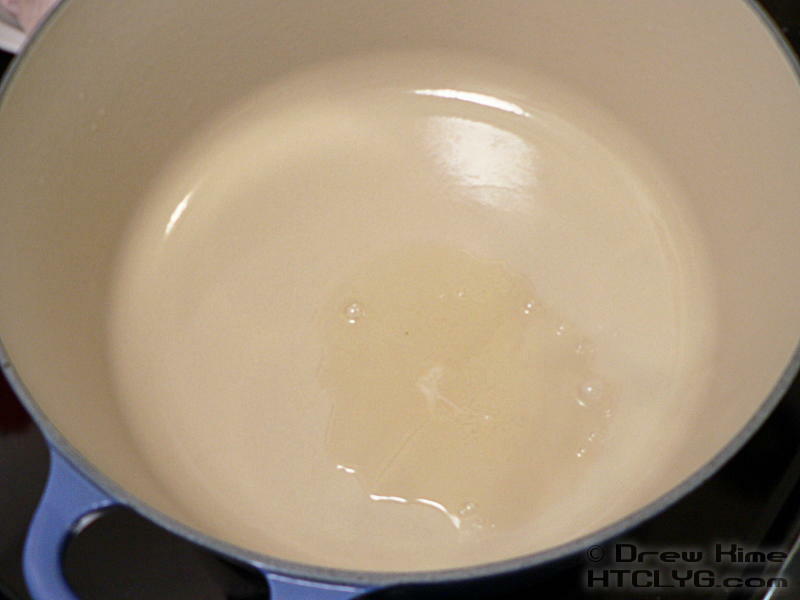 With beef or pork that’s what I’d recommend, so the salt has time to draw out some liquid for the Maillard reaction to get going. 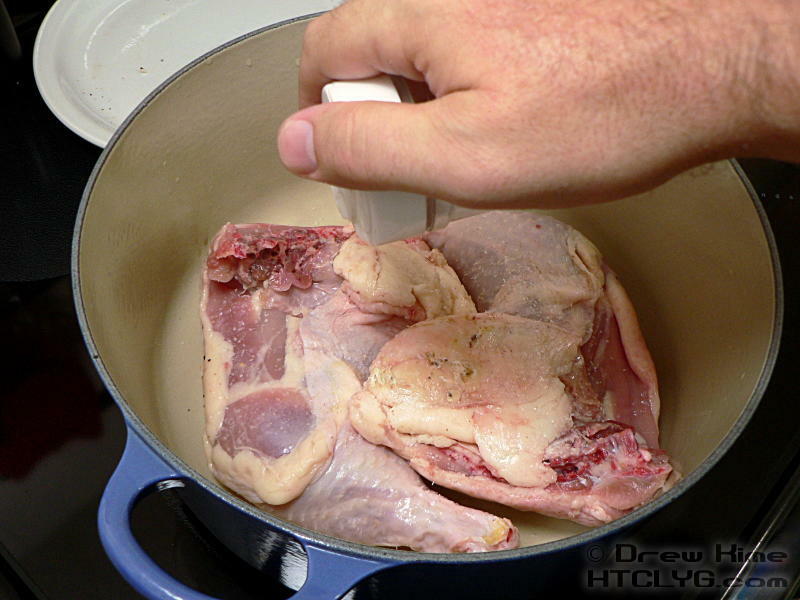 With chicken, the skin is going to keep the salt away from the meat so it doesn’t matter as much. 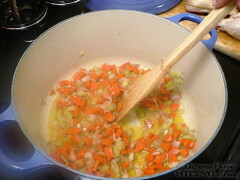 … then pull it out and add the mirepoix. The skin stuck to the pot a little bit, so Winnie and I had no choice but to peel it off and have a crispy, salty snack. Cook until the onions are soft, stirring occasionally, then add the chicken back in. 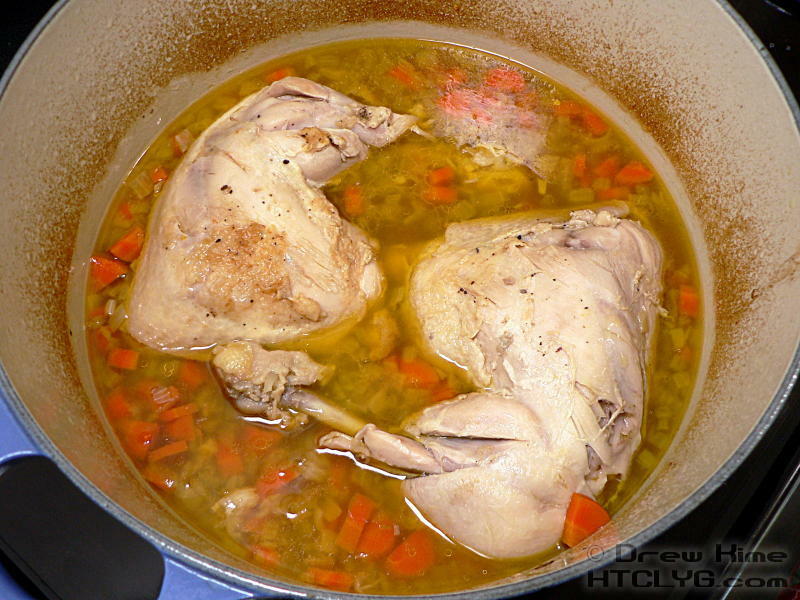 Add the stock or broth, cover, and put in the oven for an hour. 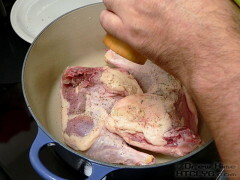 When it’s done, the meat will be pulling away from the bones on its own. Using a slotted spoon, scoop the mirepoix out of the broth. 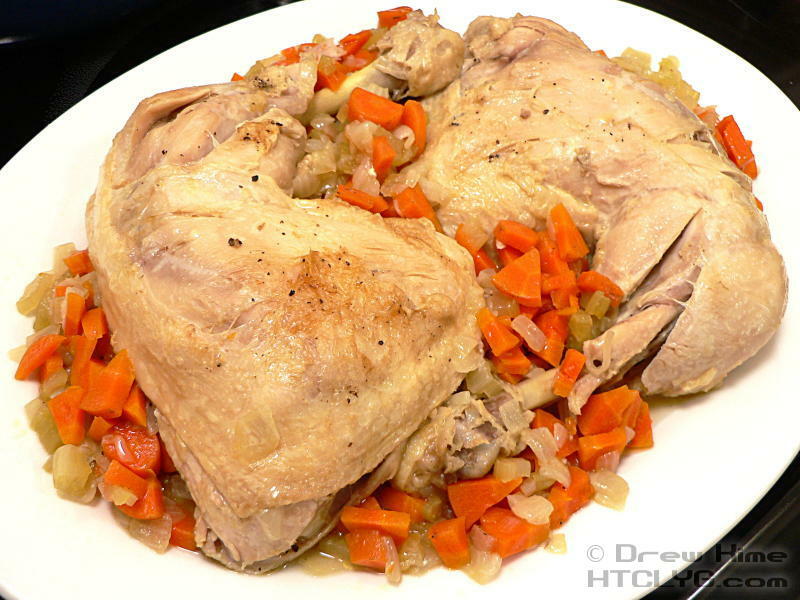 Put the mirepoix on a serving dish, and the chicken legs on top. 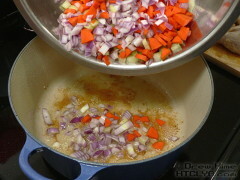 Clean and dice the vegetables for a mirepoix. 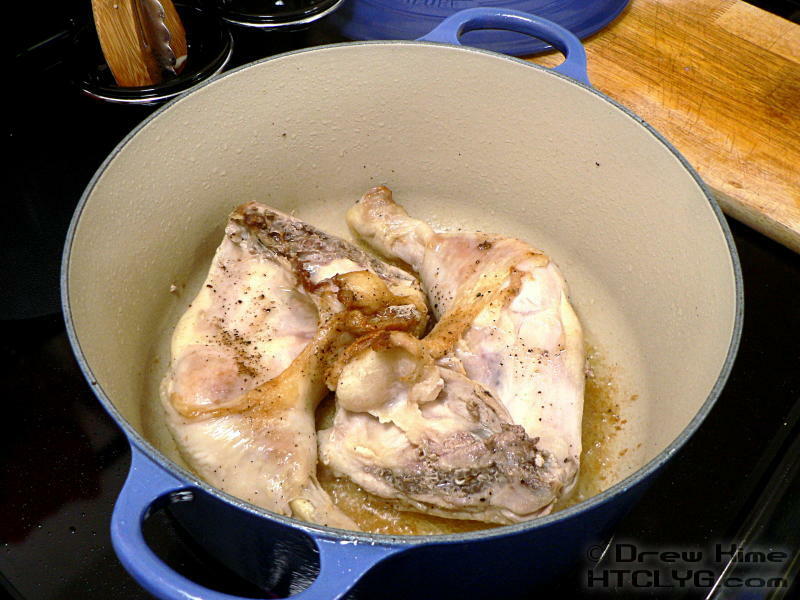 Melt the bacon fat or butter in a Dutch oven over high heat. 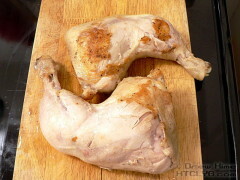 Season the chicken, and brown on both sides. 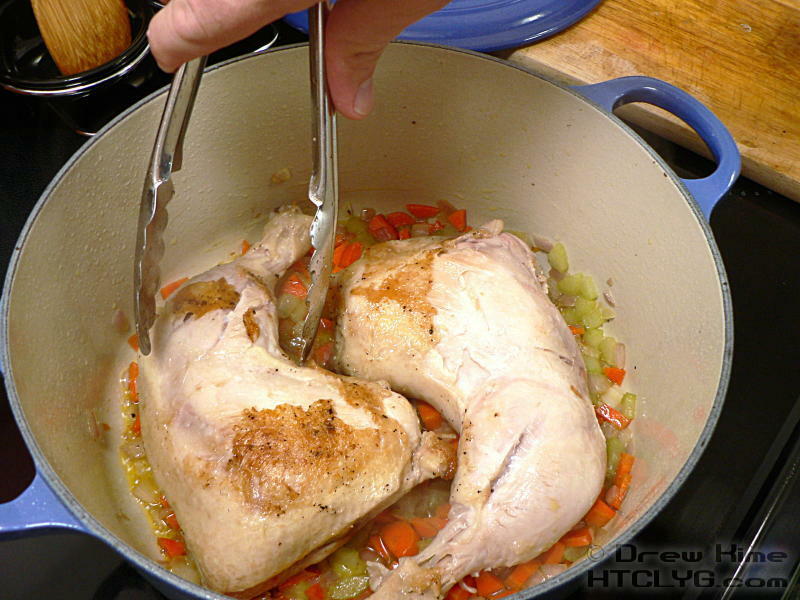 Remove from the Dutch oven and add the vegetables. Cook until the onions are soft. Return the chicken to the pot, and add the broth. Cover and bake at 350° for an hour.